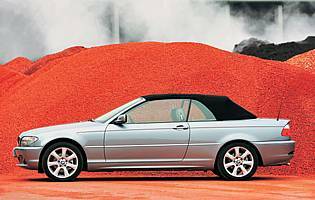 BMW's 3 Series Convertible is a popular car, and with good reason. Boasting an unrivalled reputation for driving dynamics and a brand image that's second to none, it's easy to see why it's the car of choice for so many people. A classic and instantly recognisable design, the drop-top Three's might not be the cheapest or the best equipped but it does offer the keen driver a good time. Unlike certain convertible cars in the prestige sector, BMW's 3 Series is one that not only looks good but goes well, too. Over the years it has built up a loyal and sizeable following, something that has done no harm at all to the car's second hand values. In truth BMW's rag-top 3 Series' success has been down to the fact that serious competition has only appeared in the last few years, and even then no other car offers the same combination of driving excitement and desirability. Some rivals do well in the looks department or offer genuine four-seater capacity, but no other can match the BMW's all-rounder status. Granted the 3 Series is not a true four-seater like Audi's A4, but what it lacks in terms of overall space it makes up for with its ability to please the enthusiastic driver. The rear-wheel drive Three is more driver-centric than any other soft-top in this market, as you would expect given BMW's bias towards sporting cars. The result is a car that offers all the benefits – and some of the drawbacks, such as limited rear space and a modest boot – of drop-top motoring. The added bonus is that you get a car that performs more like a coupe when driven with any enthusiasm. While you can cruise around town in order to get noticed, the 3 Series also allows you to enjoy the attributes of a conventional sports car. Few cars, let alone convertibles, can match the 3 Series' appeal. Some, like Audi's A4, come close in many areas and even beat the BMW in the build quality department. However, the Three trumps the lot if you are an enthusiastic driver. The prospect of the open road and a drive in a convertible is immediately boosted if you're in a 3 Series. It's not the cheapest offering nor the best equipped but it is the best to drive. 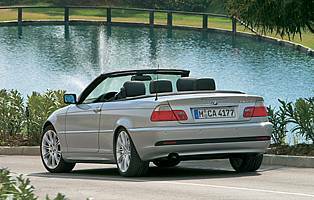 No 3 Series Convertible could ever be described as a bargain buy, but at least equipment levels have improved over the years. The electric roof is an obvious plus point when considering bang for buck issues, as is the car's popular status and strong resale values. Insurance for rag-tops is never cheap, and unless you opt for diesel power you'll also pay a fair bit for fuel. You don't buy a convertible for its practical and family friendly touches and despite the inclusion of rear seats in the 3 Series, it's really only for two adults. Small children will be fine in the back but the front seats don't fold forward far enough for adults to make a dignified exit from the rear. The front of the car might be pure 3 Series saloon, but at the back there are compromises. Unlike the E90 3 Series saloon, this older generation E46 convertible does without fancy gimmicks and iDrive controllers. What you get is clear, concise instrumentation and quality switchgear where you expect to find it. Given BMW's propensity to supply gearboxes with rubbery manual gearshifts and light, springy clutches, the respective controls on the 320Cd are pleasingly precise and easy to modulate. The electric roof operation requires you to press and hold the appropriate button, but there's no need to unclip awkward catches. When buying the car you need to make a choice – whether to opt for the firm-riding Sport variant or the more compliant SE. The former is an enjoyable steer for the enthusiast, but you'll curse the car when it fails to smooth out poorly surfaced urban roads. It's not all bad, as the Sport's grippy front seats are supportive and hold you in tight when tackling a series of corners. As you would expect, noise levels are higher thanks to the fabric roof, but not enough so as to spoil a journey. The (optional) wind deflector works well, yet even without it motorway speeds are easy to live with. No convertible with a fabric roof can be totally secure, only a car with a metal folding item will give you the same protection as that of a tin-top car. That said you do get the usual array of anti-theft measures from BMW, such as remote central locking and an immobiliser. And although the 3 Series isn't a hugely expensive car it is extremely desirable, making a tracking device a worthwhile investment. There's nothing better than having a steel roof between you and the rest of the world, but the safety of convertibles has improved in recent years, what with improvements to rollover protection. On a more mundane note, you get the usual package of features – anti-lock brakes, traction and stability control – plus the option of powerful xenon headlamps. The 3 Series is famed for its driving dynamics, but most comparisons are done with either the saloon or coupe variants. The drop-top, thanks to that lack of a steel roof, is not quite as sharp on the road, although its shortcomings will only really be evident to those with exceptionally keen senses. In the main the 3 Series Convertible is great fun to drive and more responsive than rival offerings and blessed with a decent spread of engines. Top marks go to the flagship 3.0-litre petrol unit and the diesel variants. The former sounds fantastic and is not short of grunt, while the oil burners combine decent performance with impressive fuel economy. With minimal space available for rear seat passengers and a boot that's smaller than the size of the saloon's, this convertible is unlikely to find favour with a family. As a second car in a busy household it starts to make more sense, although even growing children will soon grow out of the rear seat accommodation. If you've got the cash, the car is no more challenging to drive than a regular 3 Series, save for the increased rear blind spot due to the fabric roof's overlarge rear pillars. Insurance companies are likely to charge a stiff premium though, as the combination of a high value convertible driven by a novice is hardly a low risk combination. 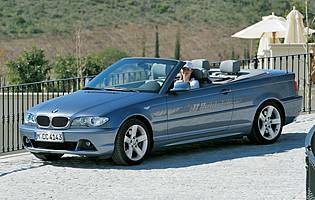 The 3 Series Convertible has been popular car for many years. Combining BMW's usual high levels of presentation with the simple fact that convertibles from the prestige end of the market are always sought after, the car has attracted many fans through the years. The E46 model is no different, and cleverly combines all of the above with a practical powered roof and a driving experience close to that of its tin-top cousin, the Coupe. Front seat occupants will have little trouble getting in or out of the car's cabin. Big, wide opening doors help matters, as will situations when the roof is down. However, set the seat too low and you might find yourself climbing up, not out, of the cabin. The car's rear seats are almost token affairs and struggle to accommodate an adult of even modest proportions. Children will fare better, but even then the front seat recline function doesn't allow the chair to slide forward for improved access. Access to the saloon-like boot is reasonable, although soft bags are better than hard cases given the modest opening available. The standard fit unit is a decent entertainment system, but it's not going to win any prizes for dazzling you with its abilities. While steering wheel controls are welcome, you'll need to delve into the options range for more powerful audio systems, CD changers and sat-nav. The latter is one of the better ones on the market, and comes with a big colour screen. There's also a television option and provision for a handsfree mobile phone. Pick any colour you want but make sure it's silver is an honest evaluation of what works best. Dark metallics – especially blue – also work well, but silver with a black roof is a particularly pleasing combination. Cabin decor is largely dependant on what trim level you choose. The Sport model, for instance, gets carbon-like inserts on the fascia and door areas – a feature that lifts the otherwise sombre cabin. Fabric and alcantara trimmed seats complete the look, although leather is the recommended option. One thing's for certain, roof down parking is much easier than with the roof up. It might not be as practical with the top down, but at least you don't have to contend with the car's sizeable rear blind spot. Sit too low in the car and it's easy to obscure its nose, too. Overall, parking is straightforward once you're well versed with the BMW's exterior dimensions. And there's also parking sensors to aid your progress rearward. Petrol engine options – 318Ci (150bhp); 320Ci (170bhp); 325Ci (192bhp); 330Ci (231bhp). Diesel engine options – 320Cd (150bhp); 330Cd (204bhp). Five-speed manual gearbox standard, 320 Cd, 330Cd and 330Ci get six-speed manual 'box. Five-speed auto available on petrol models, with sporty SMG auto available on 325Ci and 330Ci variants. Diesel cars cannot be had with an auto 'box. Trim levels: Se and Sport.